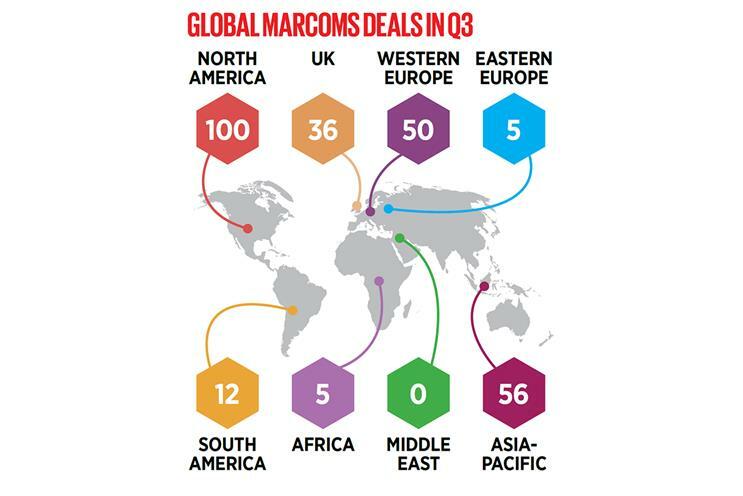 The number of global marcoms mergers and acquisitions deals have risen by 7 per cent in the last quarter, driven by an increase in cross-border activity. According to Results International, there were a total of 264 deals during July to September, compared with 246 in the April-June period. About 36 per cent of these were international, up from 26 per cent in the previous three months. There was a geographical shift in activity. Although the majority of the companies acquired during July-September were based in North America (38 per cent), this was a decline from 46 per cent in the previous quarter. There was an increase in activity in Asia-Pacific, up to 21 per cent from 16 per cent in the second quarter. Integrated agencies were the most popular targets (10 per cent of the total, from 7 per cent last quarter).